Ekmek kataifi was my first “big project” in baking and that is when I was still a teenager. It was my first attempt of making a dessert, a little more complicated than a bundt cake, by myself and with no help. It was a recipe I had found on the package of the kataifi dough and from the first time I read it, it was clear to me that it would be a hit. And it was indeed! A real hit! Imagine four people around the baking pan with a spoon on everyone’s hand and a continuously “mmmmmmm” to be the only sound in the room! 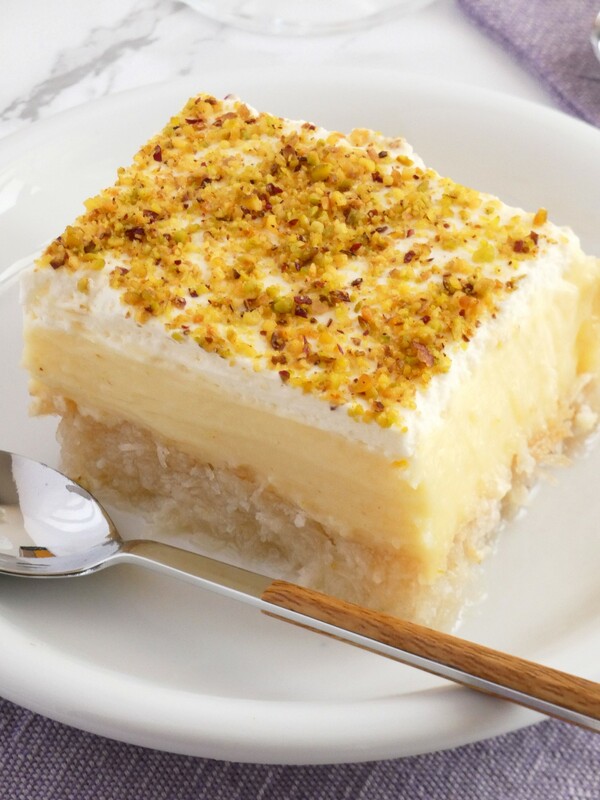 Since then I have made ekmek kataifi a million times and it is always a success among my guests or my family! 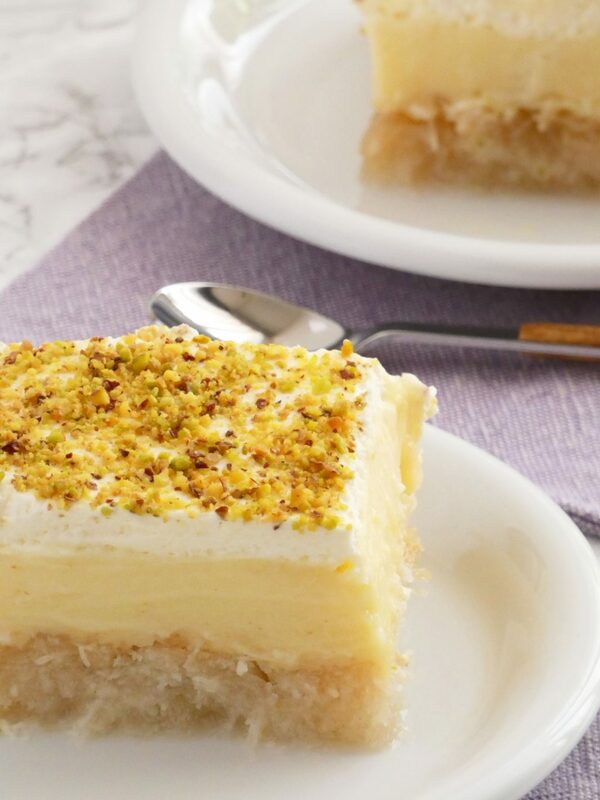 Ekmek kataifi is a dessert that consists of three delicious layers. Syrupy kataifi dough for the base, an extra tasty pastry cream in the middle and an airy whipped cream on the top. It may sound a little “heavy” but it is not! 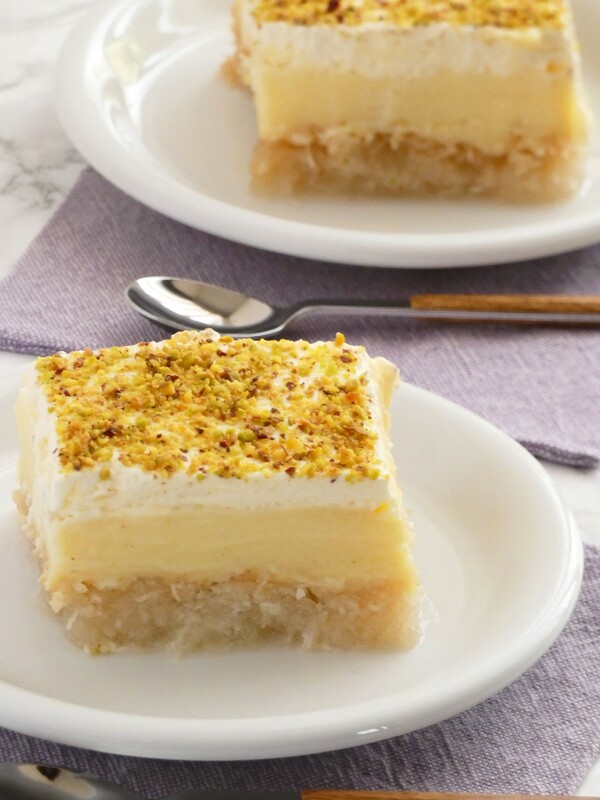 It is light and refreshing, not overly sweet and so creamy and flavorful that is worthily among the best Greek traditional desserts. Don’t be scared of the long recipe and the many stages of it. It is not as difficult as it seems. 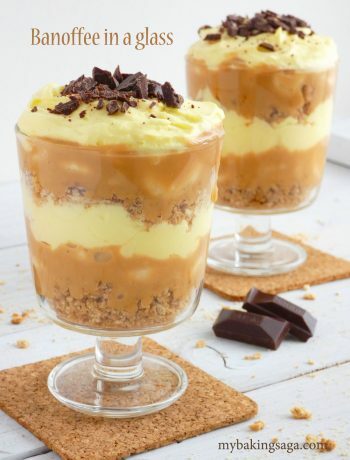 It may need four different preparations but each one of them is simple and easy to make. I tried to give you a detailed and easy to follow recipe so every one of you to be able to make it and I hope you will. The amounts of the ingredients in the recipe are for a big baking pan (40×32 cm) but you can adapt the amounts according to your needs. 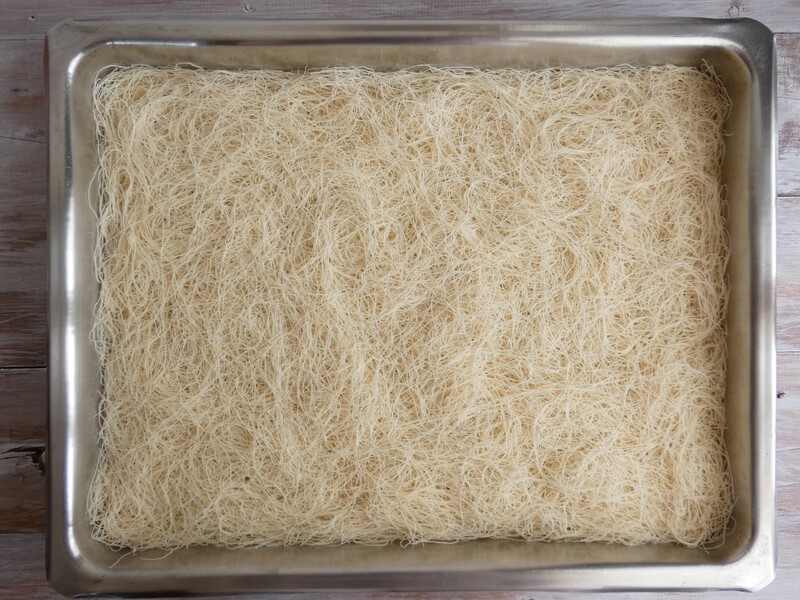 Kataifi is a special dough and should be baked until golden brown so the syrup can be absorbed appropriately and create a nice syrupy base for our dessert. 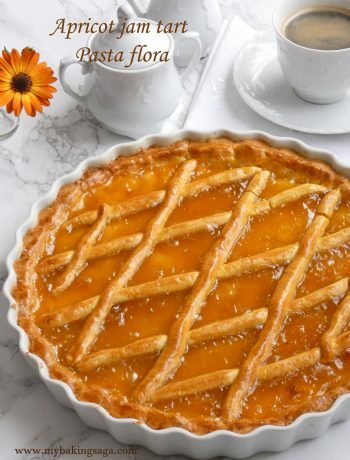 The pastry cream should be cooked over medium-low heat and under continuous whisking because it is very easy to stick on the bottom of the pan. So be careful. For garnishing I used salted and toasted pistachios but you can use unsalted if you like or even toasted almonds. First thing is to prepare the syrup so it will be cold when the kataifi is ready. Add all the ingredients for the syrup in a medium size pot and bring to a boil over medium-high heat. Cook for 6-7minutes (not more), remove from heat and let it cool at room temperature. Prepare the kataifi base. Take small amounts of the kataifi dough and using your hands pull apart the strands trying to make it as fluffy as you can. 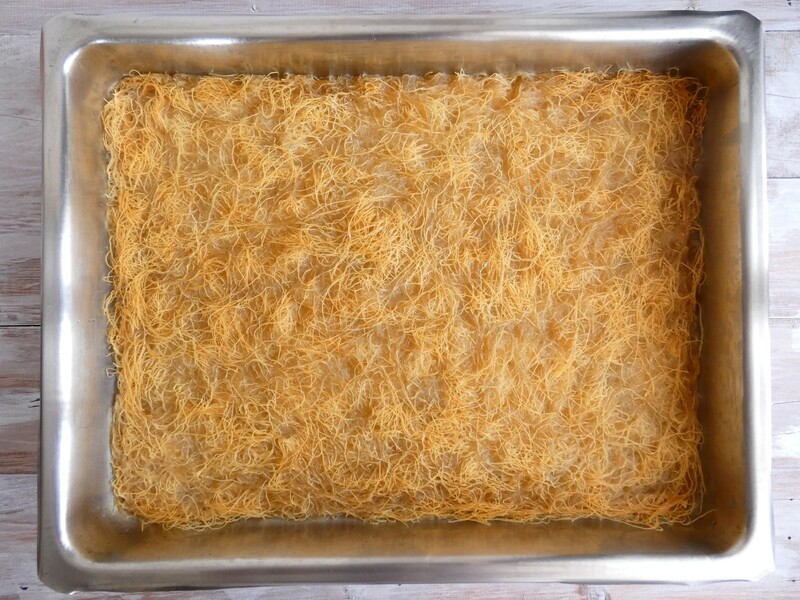 Spread the kataifi in a 40x32 cm baking pan. Drizzle the melted butter (it should be warm) over the kataifi as evenly as possible. As soon as the kataifi is out of the oven pour the cold syrup over it , 2-3 ladles at a time ( wait for the syrup to be absorbed before you add another 2 or 3 ladles). Let the kataifi cool at room temperature. Keep 1/2 cup of the milk and heat the rest over medium-low heat until boiling point. Meanwhile beat the sugar and the egg yolks together until light and fluffy. Add the 1/2 cup of the milk slowly while beating. Add the flour and the corn starch, one spoonful at a time. Continue beating in medium low speed until well incorporated. When the milk reaches the boiling point immediately remove from heat and start pouring it into the egg mixture a little at a time (about 1/4 of the cup at the beginning and a little more every time you add another) beating constantly. Continue this way until you have added about half of the milk or a little more. Stop beating and pour the egg mixture into the remaining milk stirring constantly with a spatula or a whisk. Place the pot with the mixture back on fire and cook over medium low heat, stirring constantly with a wooden spatula. As the custard starts to thicken you have to whisk harder so no lumps will be formed. When the custard reaches the boiling point (bubbles will start to appear) remove from the heat. Add the butter and stir to incorporate. Let cool in room temperature for about half an hour, stirring often to prevent skin formation. 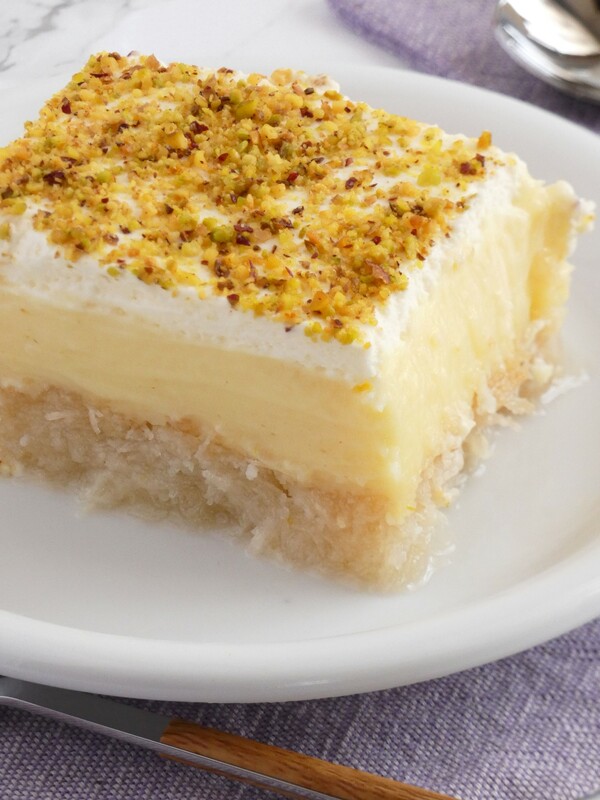 Pour the pastry cream over the kataifi and spread it evenly over the whole surface. Cover the pastry cream with cling film in a way that the film touches the surface of the cream and try not to let any air bubbles between the cream and the film. Let it cool completely at room temperature or in the refrigerator. In the bowl of an electric mixer add the heavy cream and the powdered sugar and beat on high speed until cream thickens and medium to stiff peaks is formed (about 1 minute). Do not over beat because the cream will be destroyed. Spread evenly the whipped cream over the cooled pastry cream. Refrigerate for 3-4 hours or better overnight before serving.